Carlos: What's your profession Javier? Do you consider yourself a home barista? Javier: I work as a civil servant for the Government. Yes, I prepare my coffee only at home although lately I'm more frequently asked to prepare coffee at work, parties or dinners with friends. 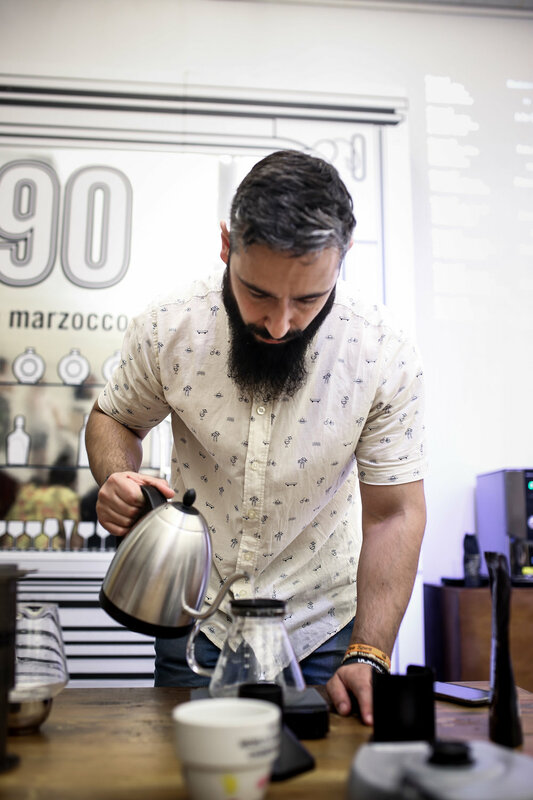 Carlos: This is not the first time that a home barista wins the Spanish AeroPress Championship. Actually, Lara San Miguel in 2014 and myself in 2016, we both won the Championship in the same period we were becoming coffee professionals. It's really interesting how the distinction between amateurs and professionals doesn't apply to the AeroPress Championship. How did you discover specialty coffee? Javier: I used to drink only tea and I always tried to look for quality, but where I live getting full-leaf tea was impossible. This is how I contacted a local coffee and tea supplier. Whenever I went to buy tea he tried to sell me coffee and I always answered the same: first, that I didn't like it; and second, that I don’t feel good after driking coffee. One day during one of my visits they were brewing a V60. I was invited to have one and I decided to try it. It was an Ethiopia Woreda Shakiso. It was the first COFFEE I had ever had and it was delicious! It looked much more like some of the teas I used to drink than what I knew until then as a "coffee". Since that day everything was like an hurricane: I was looking for information about origins, ways of preparation, and how grinding, temperature and water composition affect the final coffee flavor. Every week I was looking forward to try new coffees and see how different they could be, and discovering different ways of preparing them according to the type of coffee. What worked well with one, didn't work with another. Thrilling! Suddenly, what once was just something that would help me stay awake, became something more! I had a new hobby! Carlos: How did you decide to compete in the Spanish AeroPress Championship? Javier: I am very lucky to live in Melide, the headquarters of Coffee Spirit. One day I found out that the first Galicia AeroPress Regional would be held there, so I asked to attend in the audience to see the Championship from within. As everyone can participate and there's no need to be professional, anyone has the opportunity to win. Paying only 20 euros for the registration fee already gives you two bags of specialty coffee. You already earned something! They asked me to participate and they convinced me. Carlos: LOL. 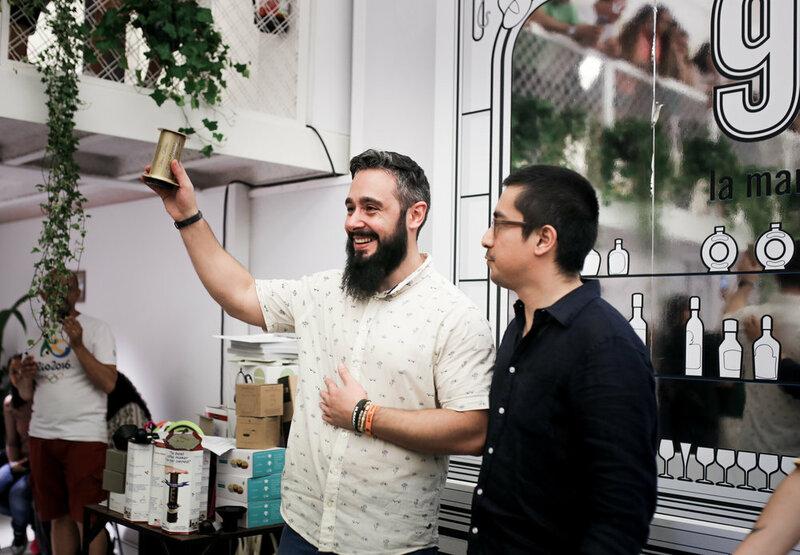 So you went to the Regional in Coffee Spirit only to observe, and you ended as the 2017 Spanish AeroPress Champion! That's amazing! I guess you had some involuntary trainning at home. Or at least the AeroPress must be your favourite brewing method. Javier: Actually not. At first my favorite method was the V60. Now when I make coffee for several people, I usually use the Kalita wave, but when it is only for myself, the AeroPress is certainly my favorite method. It is the most fun: it allows you to play like no other. It can be used as an immersion system when using the inverted method or as a continuous flow in the traditional method, but you also have one more factor: the pressure. I've realized how you can make some particular features of a coffee that are masked with other methods, to come up. With the AeroPress you can get a muted coffee brighter and sparkly. Carlos: You're a natural then. What's the secret to brew an awesome AeroPress coffee? Javier: First thing I do is trying the coffee in a Brazilian cupping with other coffees, although only a single cup. 250gr of test coffee doesn't give you a lot of space. Then, I plan what flavours I would like to highlight and which ones I would like to hide. Then is when I imagine the type of water, temperature, grind size, etc., that can help me to achieve the final cup. Afterwards, I try to make just one or two coffees every day following the exact same recipe. And I found out that what I thought it was good the day before, the next day maybe I don't like it that much, so I keep improving the recipe. Carlos: That's a really smart way to work with the AeroPress. You’re flying to Seoul in a few weeks to represent us in the 2017 World AeroPress Championship. What’s your goal there? How did you prepare in the last months? Javier: To my surprise, I've been fortunate enough to win the National Championship last June. As it is an honor to be in the World Finals, I have been preparing myself deeper for Seoul. I have taken some brewing courses in Coffee Spirit, and also tasting courses in Xorxios that helped me a lot to understand coffee better. My main goal is to enjoy the event to the fullest, to have fun and meet other coffee lovers from the rest of the World. Being in the finals of the World AeroPress Championship is a great achievement on its own. I would like to do my best for all the people who made the Championship possible from the Regionals to the Finals. Carlos: We want to give special thanks to Jose Sanguiao and his team for making the Galicia Regional competition possible. Congratulations for your excellent work training coffee professionals, and also for spreading the love for coffee and the AeroPress in the whole Galicia community. Without Coffee Spirit we wouldn't have the amazing Champion we have today.